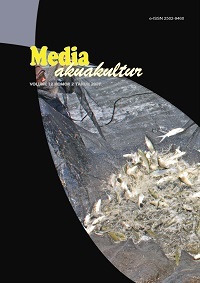 Media Akuakultur (p-ISSN 1907-6762; e-ISSN 2502-9460) with RISTEKDIKTI Accreditation Number: 21/E/KPT/2018, 9 July 2018 is the field of aquaculture container information such as the results of research, reviews, opinions, ideas, and news about the actual scientific written. Published biannually funded by Research Center for Fisheries, Agency for Marine and Fisheries Research and Human Resources, Ministry of Marine Affairs and Fisheries. Manuscripts that submitted to Media Akuakultur should be consistent with Focus and Scope, then verified according to Guidelines including plagiarism using standard Plagscan and Turnitin as plagiarism detection software, Google Scholar by the Assistant Editor. The author should attach the Results of Plagiarism Analysis and statement regarding the originality of manuscript.